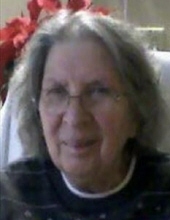 Marjorie A. Meadows, 87, of Franklin, passed away at 4:50 a.m. on Thursday, January 24, 2019 at Oil City Healthcare and Rehabilitation Center. Born April 24, 1931 in Franklin, Marjorie was the daughter of the late Miller and Dorothy Redmond Reed. She married Floyd M. Meadows II, and he preceded her in death. Mrs. Meadows worked for more than 21 years at the Chicago Housing Authority as a Security Clerk. She lived in Chicago for over 50 years. In her spare time, Mrs. Meadows was passionate about church and singing in her church choir; she sang at the East Grove Church United Methodist Church in PA and in the Southlawn United Methodist Church in Chicago. She also loved to work in her garden. She is survived by her son, Floyd M. Meadows III of Aurora, IL; her daughter, Lynda Meadows of Franklin; her brother, Donald Reed and his wife, Donna; her sisters, Meriam (Joan) Smith and Emily Jane Reed and her husband, Bill Allen, all of Franklin; and her many nieces and nephews. In addition to her parents and husband, Marjorie was preceded in death by her 3 brothers, William Reed, Harold "Bert" Reed, and Paul Reed; and her brother-in-law, Gene Smith. As per the family's request, there will be no visitation. Burial at Glen Oaks Cemetery, Hillside, IL will be announced at a later date. The Gardinier Funeral Home, Inc., 1315 Chestnut Street, Franklin, PA 16323, has been entrusted with arrangements. Memorial contributions can be made in Marjorie's honor to the Parkinson's Foundation, 200 SE 1st Street, Suite 800, Miami, FL 33131. To send flowers or a remembrance gift to the family of Marjorie A. Meadows, please visit our Tribute Store. "Email Address" would like to share the life celebration of Marjorie A. Meadows. Click on the "link" to go to share a favorite memory or leave a condolence message for the family.